We’re back in Kentucky from our sojourn in Nashville. As Kentucky is the home of Fort Knox, Padma breaks out a whimsical part Escape Room, part Top Chef Season 1-type challenge. She brings out a locked, glass case filled with bouillon cubes in them. Those will be the only seasoning the chefs have access to during the Quickfire—even salt and pepper are off-limit. In order to unlock the case and get access to the bouillons, they’ll have to solve four cooking clues in order to get the four numbers that serve as the combination for the lock. The first clue asks for a food with the same name as the agency tasked with protecting the U.S. treasury at Fort Knox. They identify mint and Justin sends Adrienne (isn’t she still sick???) to run off and get the first number. Next is a kitchen tool that doubles as something used to pan for gold. That’s something called a “tammy”? Never heard of it, but the chefs have and they grab that number, too. Third is a food popular around the world—one of the oldest, in fact—and doubles as a term for money. That’s bread (or is it dough?) and again, Adrienne has to run and grab the number. Finally, the clue asks for a slang term for money, dating back to when the item was traded in lieu of modern currency. That’s a clam, and with all four numbers (gathered in a mere four minutes), the chefs are in business. With Guest Judge Ed Lee presiding with Padma over the Quickfire—not only is he a Top Chef alum, but he also has multiple restaurants in Kentucky—the chefs aim to please but run into difficulties early. Justin messes up by adding too much bouillon, Adrienne burns her bread cubes . . . it’s a rocky start but the chefs bring it home. Michelle has a fritto misto with beef bouillon with an achiote puree and a tarragon aioli. The flavors are good but Ed can’t find much bouillon flavor. Sara has a roasted monkfish with chicken and vegetable bouillon stock. The broth is great—salty, but balanced. Eddie stays with the Gold Knox theme by cooking all yellow vegetables to go along with his poached bay scallops and mint. Padma adores his use of preserved lemon to add more flavor. Adrienne’s few remaining bread cubes go into a panzanella salad with a herb vinaigrette. Eric’s grilled Chinese eggplant with hanger steak is great, with the vegetable bouillon importing a ton of flavor to the dish. Kelsey makes a very fresh-looking dish in the form of a bruschetta-meets-BLT, with tomatoes, pancetta, and vegetable bouillon. His salt-bomb-of-a-Quickfire easily lands him on the bottom, along with Michelle’s underuse of bouillon. On top are Sara, Eric, and Eddie, who takes home the crown for his delicate and refined dish. Padma promises that he has won an “incredible advantage,” and that’s a lie. It’s not an advantage . . . it’s a total exemption from the Elimination Challenge altogether. While the other six chefs are going to be battling in a three-on-three, head-to-head cooking competition in Rupp Arena, home of the University of Kentucky basketball team (hometown girl Sara emits a high-pitched, excited squeal when the challenge is announced), Eddie will sit on the sidelines and simply enjoy the spectacle. That’s a huge win for Expressionless Eddie, who somehow manages to form something resembling a smile and human joy in response (I mean this in the nicest possible way—Eddie’s just such a nice, fun guy and it’s fun to rib him a little bit on this). The remaining six chefs break off into three teams—the Blue Team with Kelsey, Michelle, and Sara, and the White Team with Adrienne, Justin, and Eric—to discuss the dishes they plan to serve to an arena full of fans. Top Chef sure has loved its head-to-head challenges lately. They already did one version of this for the Kentucky Derby challenge that opened the season, and had a memorable Olympic-themed challenge last season. The chefs smartly plan to make food that’ll appeal to the sports masses—ribs, chicken and waffles, fried chicken . . . it’s all fatty, salty food that should satiate any UK basketball fan. Meanwhile, Eddie waits around eating an apple. It’s then off to Whole Foods to spend a $2,000 budget. Eric gets a ton of chicken drumettes to make fried chicken, lollipop style. Kelsey grabs a bunch of vegetables to make a dumpling with (spoiler alert: it’s more of a pot sticker than a dumpling). Meanwhile, we’ll have a showdown between chicken and waffles, with Adrienne doing it on the White Team and Sara doing it on the Blue Team. There’s a bit of drama as Adrienne notices Sara grabbing a boxed waffle mix—some information that she stores away in the back of her mind. Meanwhile, Eddie, eats some sushi by himself by the Whole Foods café. The next day arrives and we’re at Rupp Arena for the challenge. To provide a bit more manpower behind the challenge, each team gets some help in the form of eliminated chefs from this season—David and Kevin for the Blue Team, and Brian and Caitlin for the White Team. Prep starts off a bit rocky for the Blue Team. Michelle wants to do ribs in the style of what she makes at home for Golden State Warriors games, except that those ribs are cooked over the course of 4-5 hours. She isn’t getting the same type of caramelization today with the shortened timeframe. Meanwhile, on the other side of her station, the fryer that Sara is using to cook her fried chicken keeps turning off. Both of them decide that they’ll have to finish cooking their proteins on the stadium floor. Tom and Graham enter the kitchen to check out how things are going, and it’s a pretty calm affair until they saunter over to Adrienne. Tom notes that Sara is also doing chicken and waffles and asks Adrienne whether she’s making her own waffle batter. 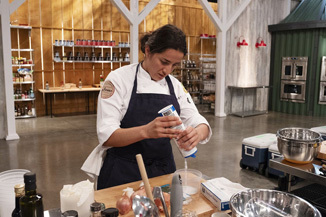 Adrienne is all smiles, responding in the affirmative and wondering how anyone on Top Chef could even think about using a boxed mix. That said, she notes slyly, throwing a dark look Sara’s way, there might be some other chef who’s using a box mix to make her waffles. She arches her eyebrows and gives one last knowing look before turning her attention back to her chicken.